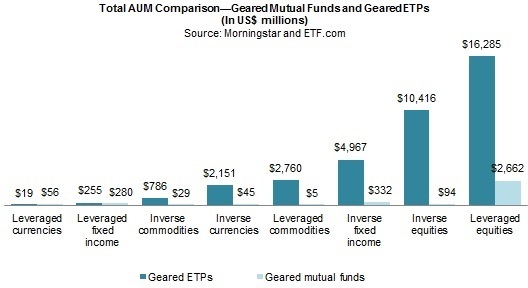 Inverse and Leveraged Funds: Swing for the Fences Every Day? Absent public education, geared funds’ long-term growth could stagnate or even decline. Boston, January 20, 2016 – Inverse and leveraged funds were first introduced as short-term alpha-generating tools that rebalance or reset their portfolios daily. Some newer entrants to this category have launched funds that rebalance their portfolios for periods longer than a single day, henceforth allowing investors to make directional bets for intermediate time horizons. This nontraditional investment vehicle has reached a fork in the road: Can education, better risk management infrastructure, and new product innovation help sustain this sophisticated financial product’s long-term viability? This research examines geared funds and dispels some market participants’ misconceptions about these newfangled investment vehicles. It is based on the amalgamation of publicly available market data and information as well as 2015 Aite Group interviews with seasoned professionals at various U.S. organizations in the wealth management industry. This 32-page Impact Note contains 14 figures and five tables. Clients of Aite Group’s Institutional Securities & Investments or Wealth Management services can download this report. Liquid Alts: The Right Supplement to Satisfy Retail Investors’ Appetites? Liquid Alternative Investments: A Passing Fancy, or the Real McCoy? U.S. Listed Equity Options Markets: Where Have All the Cowboys Gone?